An authority-submission structure marks the very nature of the eternal Being of the one who is three. In this authority submission structure, the three Persons understand the rightful place each has. The Father possesses the place of supreme authority, and the Son is the eternal Son of the eternal Father (21). The Father gets top billing, as it were (51). Equality in substance, but permanent stratification in roles is a position not even held by all complementarians, but is being put forward by an increasingly vocal constituency of scholars, many of whom are motivated by a concern for locating hierarchy in male and female relations in the exalted standard of the Godhead. In light of this trend, historically-orthodox readers, disturbed by what appears to be sub­trinitarian views qualifying the "one God in three co-equal Persons," will welcome the reappearance of one of the most important and least noticed statements of the mid-1980s "battle for the Trinity." Gordon-Conwell Theological Seminary New Testament Professor emeritus Royce Gruenler's landmark study, so far ahead of its day, when published by Baker in 1986, was not intended to be a part of the gender debate. In fact, the author states explicitly: "[I] hope that my thematic emphasis on mutual servanthood will not be misconstrued as an egalitarian attack on levels of authority that are biblically described and mandated" (xiii). The presence of that disclaimer is why the conclusion that immediately follows is so compelling: "At the same time I express concern that overemphasizing the model of authority/submission may reintroduce the one-way subordinationism that troubled earlier discussion of the Trinity in the history of the church." As he explains, "Using the language of Jesus in the fourth Gospel, that within the inner relationship of the eternal Triunity the Father always commands and the Son and Spirit always obey, that only the Father authoritatively speaks and the Son and Spirit always passively listen, but never the other way around, and that yet at the same time neither is principally inferior or superior to the other" is "a category mistake." Once operating within this error, he concludes, "The best one could do under these circumstances to salvage Jesus' claims of equality with the Father would be to speak of this equality on the impersonal level of unity of substance in the Trinity (category 1) where there is perfect oneness, coupled however with inequality on the level of subsistence as intercommuning persons (category 2)" (xiii-xiv). This "category mistake," of course, is exactly the route much current complementarian discussion that presupposes subordination in the Trinity has taken. So, what should be the correct view according to this expert assessment of John's gospel? "The subordination of Son and Spirit to the Father is for the time of redemption only; hence Jesus' subordinationist language describes what have traditionally been called the 'modes of operation' that pertain to the accomplishment of the redemptive task" (xiv). As one can clearly tell from these quotations, with some four decades of seminary teaching, and five books and numerous articles to his credit, Gruenler sees clearly the theological dangers of the eternal subordinationist interpretation, but he has arrived at his conclusion inductively from a vast knowledge of history and exegesis, not deductively from social or political concerns. 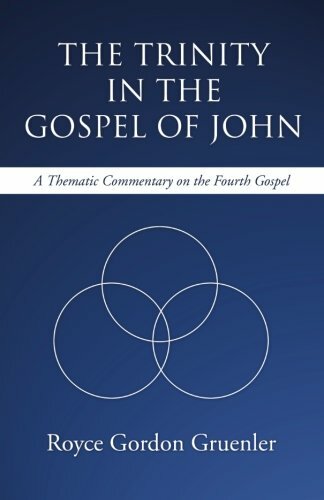 What supports these conclusions is a very thorough, careful, and at times quite beautifully phrased study of the Trinity in John's gospel. Stratification in the Trinity, of course, is only one of numerous subjects about the relationship within the Trinity this book explores. Chapter 1 discusses "the social nature of God," showing how God is a God in "conversation" within the Godhead and with "the human family" and portrays Christ's redemption of humanity as also restoring "right speaking." Chapter 2 examines "the divine Community" in John 1-7, presenting the incarnation as the expression of the "divine Family's" love for the world. Chapter 3 explores the relationship between the Father and the Son, as revealed by Jesus in his teachings and illustrations in John 8-12, and shows clearly that Jesus understood his full equality within the Godhead (the "divine Society") and his role on earth in the "astounding claim that he is spokesman for the divine community" (87). Chapter 4, "The Triune Community of Father, Son, and Holy Spirit: John 13-16," recounts how Jesus models the love relationship in the Trinity for his disciples, teaching them how "the availability of the Son to the disciples must be matched by the availability of disciple to disciple" (91). That goal culminates in chapter 5, "That They May Be One Even as We are One," which reveals Jesus' lasting impact on his disciples in John 17-21, so that "the fourth Gospel concludes, accordingly, on a note of divine generosity. To be at the disposal of others may entail personal sacrifice of life (21:18-19), as Jesus gave up his life for the world" (140). The spirit of"divine hospitality" with which the text concludes fittingly permeates the entire study. We are left with the lasting image of a "Triune Family" that invites us to enjoy the "love, hospitality, generosity, and interpersonal communion" (121) that is our God through a spiritually nourishing "conversation" that begins in this lifetime and continues throughout eternity. The book concludes with an appendix detailing the data on John's Gospel's historicity, date of composition, and authorship, all of which are followed by subject/author and scripture indices. Can a book of careful New Testament scholarship be devotional and uplifting as well as accurate and informative? Absolutely. The intellect does not have to be sacrificed for the spirit to be lifted.